Ash Ketchum Fondles His Balls in a Pokémon Butcher Shop | Words. On the Internet. I am so sorry for what I am about to do to your childhood. Ash glanced around the room, eyes slowly scanning the artificially lit, uncomfortably blood-stained and meat-filled lobby. He’d been in Pokémon hospitals before, spent more than his fair share of time waiting nervously while one of his beloved friends were healed. This place didn’t look even remotely like the others, which all shared the same bright, ivory color scheme. In fact, every other Pokémon hospital prior had been owned and operated by one “Nurse Joy,” who never failed to greet Ash with her unsettling omnipresence. Instead, a rather unkempt man stood before him, his face unshaven and belly concealed beneath a blood-splattered apron. “This is a hospital?” Ash said, right hand wrapped securely around his two balls. They creatures within were too weak to fight anymore, badly damaged from their last battle. This was the first place he found that could save them, that could bring them back from the edge of death. He was desperate; within his balls resided his young Rattata and his ever-faithful Pikachu, both faithfully lying within the Pokéballs and waiting for Ash’s word. Ash glanced down at his balls, fondling them gently in his palm. He’d never had a problem letting Nurse Joy touch them before, never had any doubt in her rather impressive medical resume. This man, though, he felt a bit more, well, untrained. 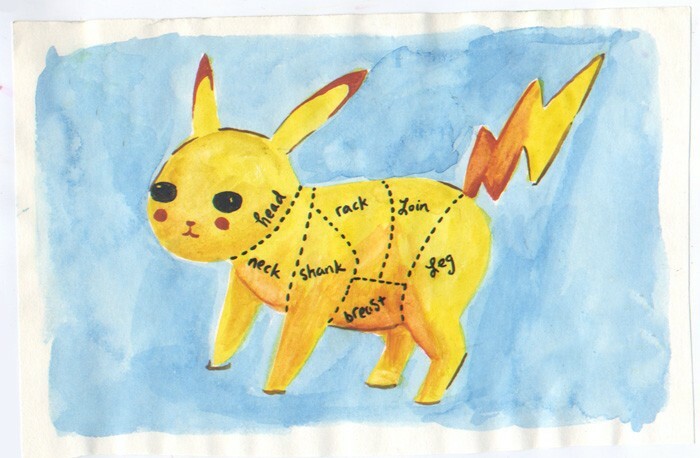 The way his long, unshaven beard collected on his blood-speckled face; the way in which he carried the butcher’s knife and couldn’t pull his eyes away from Ash’s two Pokéball’s; the way in which his Pokémon hospital was surrounded with slabs of meat that hung from every available space. It was unsettling, almost as if he were some sort of a butcher. “Where did you go to Poké-nursing school?” Ash said, hand still clutched around his balls, which were now covered in the sweat dripping from his palm. His two friends erupted out of his balls in a flash of light, coming to a stop a few feet before the butcher. They stood erect in fighting positions for a split second before going limp and tumbling to the blood-speckled floor. They were too weak to fight, too weak to even stand on their own. They’d be of no help here. “Pikachu?” Ash said, watching helplessly as the man wandered off with his friends, pushing the bin into the next room as the faint sound of Pikachu’s high-pitched, weakened voice faded in the distance. I hope you elaborate more… see what happens next? ?